THERE WERE A FEW TENSE MOMENTS for Chris Olds and Mike Morgan last year as they battled to their first victory together since forming Team 10 eight years ago. But with less than a five-minute lead, the duo made it to the finish line and celebrated the win – a third championship for Olds and the first for Morgan, who’d been chasing the dream for a decade. 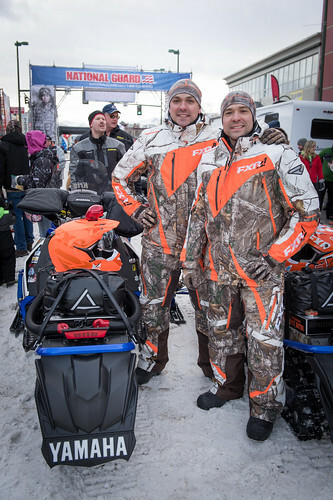 Olds and Morgan piloted their Polaris Indy XC 600s to victory with a course time of 36 hours, 54 minutes and 49 seconds. That 4-minute margin for the win gave them just enough time to take off their helmets, catch their breath and hug their family and supporters at the finish line. The rest of the racers were not far behind. A second-place finish for Robby Schachle, 32, of Big Lake, and Brad George, 25, of Wasilla, did not come as challenge-free as Team 10’s race. While they often had Olds and Morgan in their sights, the pair of veteran racers battled for every minute of their 36 hours, 59 minutes and 2 seconds race, encountering mechanical problems, weather challenges and even running out of gas at one point. Still, they were able to hold off third-place finishers Todd Minnick, 39, and Nick Olstad, 36, two veteran racers who are no strangers to victory. Minnick won the race in 2009 and 2014, and Olstad notched wins in 2005, 2009 and 2014. Their time of 37 hours, 3 minutes and 23 seconds put them more than 22 minutes ahead of the fourth-place team. The 2018 race returned to its roots last year, with the elimination of the Anchorage ceremonial start, and the first day of racing starting in Big Lake, as it used to. 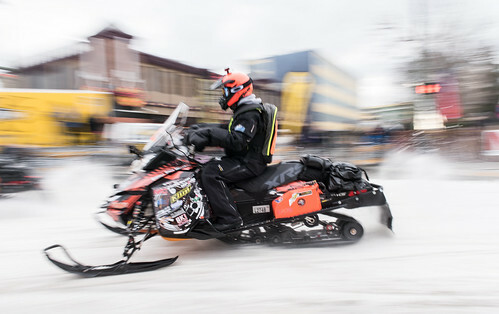 Overall, racers experienced favorable conditions, but lots of deep snow meant the leaders had to break trail – which adds to the already exhausting work of riding at speeds in the 100 mph range for days on end. Leaving the Big Lake starting chute in two-minute intervals, teams battled against brutal swamps, deep snow, thin river ice and the clock. Winding their way through Southcentral mountain passes, they broke out into the broader swaths of the Interior and the ultra-fast river corridors. The first racers to drop out were George Mountain and Kelly Sommer, just 160 miles or so from the start. A mechanical issue ended their race (but they’re back this year to try again). And, as the racers made their way to the northwest, the casualties kept coming. 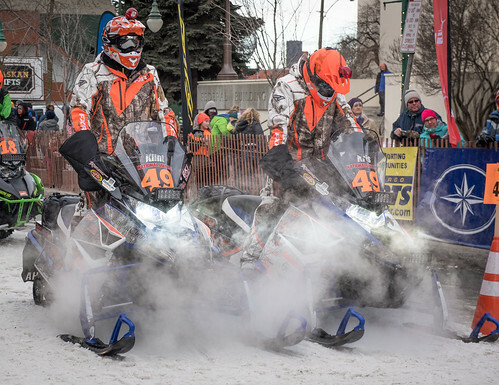 Next to leave the competition was Aaron Bartel and Tre West, in Ophir, due to an injury; then came Team 34 racers Christopher Collins and Lawrence Jones, a team out of Ambler and Kotzebue who experienced mechanical and electrical problems that ended their race in Galena. 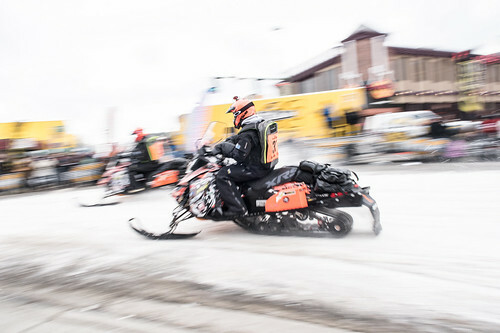 In the end, mechanical problems ended the race for two other teams (Team 22, Rachel Kidwell and Ashley Wood in Kaltag; and Team 20, Scott Faeo and Chad Gueco in Tanana), but the race continued, with 21 teams still in the hunt. That, in a nutshell, is what makes the race such a challenge, said John Woodbury, Iron Dog’s executive director. No matter how much one prepares, there are always unforeseen events – whether it’s injury, weather, mechanical breakdowns – it doesn’t matter. Iron Dog levels the playing field. As for Trail Class riders, they end their ride in Nome. The Pro Class worked on necessary repairs then headed back out 24 hours later to the Fairbanks finish. The ever-changing coastal route along Norton Sound was a fast-paced challenge as they raced back toward the Interior. Those new to the race received their education, no matter where they placed. Rookie of the Year status went to the 11th-place finishing team, Andy Gocke and Zach Weisz, from Willow and Wasilla, respectively. The two finished their race in 42 hours, 35 minutes and 48 seconds, more than five hours behind the winners, but more than 22 hours ahead of Red Lantern riders Jacob Evans of Anchorage and Tommy Germany of Palos Heights, Ill., also rookies. Germany chanced upon the opportunity to run the race in a swimming pool while on vacation, after meeting a friend of a friend who wanted to race Iron Dog himself. He jumped at the chance, and sight unseen flew to Alaska to meet with his soon to-be partner, Evans. Evans, an Alaskan, had the know-how to get the sleds prepped and educate Germany on racing logistics. But he also learned a great deal too – Alaska sealed a special place in his heart. “All the people are awesome, every village, everywhere, they are all awesome,” he said. This year, his company, Tri State Disposal, which is a garbage company that serves the Chicago area, is awarding $1,000 to the first team to scratch after leaving the checkpoint in Deshka Landing – mostly because he just feels sorry for the people who invest so much money and time into the race only to have their dreams crushed by a broken rib or crashed sled so soon into the race. And he’s also going to award $5,000 to the team that accumulates the most miles between the start and finish, because those are the ones who quite literally follow the trail markers. Despite the last-place finish, Germany was happy with the race – and most important, the experience. The first Iron Dog event started in 1984, in Big Lake following the northern route of the Historic Iditarod Trail to Nome. The event began as the “Iron Dog Iditarod,” but the name was quickly changed the next year to the “Gold Rush Classic,” to also honor the state’s Gold Rush past. In 1990 the race was organized as the “Iron Dog Gold Rush Classic” and that name stuck for a decade until Tesoro Corp. became a title sponsor. In 2008, the Alaska National Guard became a top sponsor and top supporter. 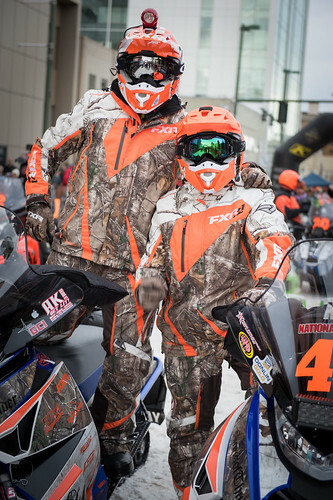 The 2019 Iron Dog enjoys a strong presence in awareness, attendance and participation by more than 20 communities across Alaska. 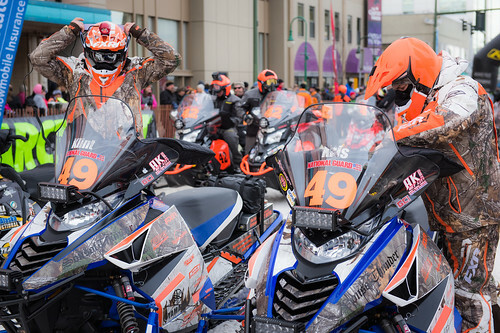 In 2015, Iron Dog made one of its most significant changes since the race’s inception by adding a ceremonial race start on the streets of Downtown Anchorage. This move not only brought more attention to the already-growing race, but also offered wintertime residents a chance to get out and enjoy the race excitement right outside their doors. However, in 2018, the race returned to its roots, with the official start line on Big Lake. 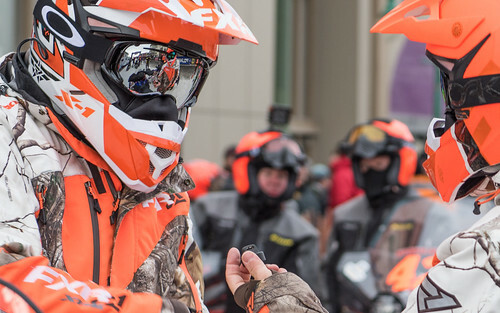 While the pomp and circumstance of Anchorage was a festive event, the racers seem to like the convenience of the wide-open staging area – and, since it’s literally the back yard for so many riders in this race, the quick commute doesn’t hurt either. The 2019 start moves to Deshka Landing, Mile 70.5 of the Parks Highway, due to safety concerns. This year, too, the race will end in familiar territory, with the finish line staged just in front of Pike’s Waterfront Lodge in Fairbanks. With the return to this location, spectators will better be able to stay warm with a meal or cup of hot chocolate inside, as they wait on the racers to arrive on the Chena River. Organizers are already planning on a busy weekend ahead as the weary racers make their way to the finish line and a well-earned nap. The most important and often misunderstood rule Iron Dog teams must abide by is that racers are not allowed to accept parts or assistance from bystanders outside of checkpoints. 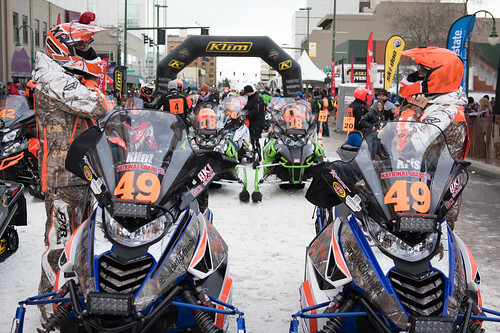 Racers are not allowed to have anyone touch their snowmachines, except when in Nome, where under the watchful eye of race marshals they may have two others assist during work time in the Nome City garage. The reason is simple: To level the playing field for teams that cannot afford to have their own chase aircraft or similar advantages dictated by a larger budget. Another rule, added in 2015, requires all riders to refuel using only fuel provided by Iron Dog at specific checkpoints. This keeps well-funded teams from setting up their own fueling stations to avoid having to stop in the official checkpoints in an effort to shave time off their stops.